The 2018/2019 Aaron Family JCC’s Margot Rosenberg Pulitzer Dallas Jewish BookFest are “Twenty-Six Seconds” (10/9), “The Fox Hunt” (10/17), “The Next Person You Meet in Heaven” (10/18), “Stakes is High” (11/1), “Irving Berlin – The Immigrant Boy Who Made America Sing” (11/4), “Husbands and Other Sharp Objects” (11/28), “Promised Land” (12/6), “God is in the Crowd (12/10), “In Broad Daylight” (2/6), “The Lost Family” and “The Lost Girls of Paris” (2/12), “Unconditional Love – A Guide to Navigating the Joys and Challenges of Being a Grandparent Today” (3/6), and “Memento Park” (4/3). The next chapter of the Aaron Family JCC’s Margot Rosenberg Pulitzer Dallas Jewish BookFest opens Oct. 9 with events featuring some of 2018’s best new releases and their authors. Unless otherwise noted, all events begin at 7 p.m. and are hosted at the Aaron Family JCC. This year’s BookFest, which opened on July 23 to a sold-out audience for “The Other Woman” author Daniel Silva, interviewed by Michael Granberry, is partnered by the JCC with the AJC Dallas, Dallas Jewish Historical Society, Congregation Anshai Torah, Shearith Israel, Congregation Shearith Israel’s SISterhood, Dallas Holocaust Museum/Center for Education and Tolerance, Israel Bonds, JCC Dallas’ Goldberg Family Early Childhood Center, the Jewish Federation of Greater Dallas’ Center for Jewish Education, Jewish Community Relations Council and Tycher Library, and the Jewish Book Council. Leiner; Rachelle Weiss Crane, the JCC’s director of Israel engagement and Jewish living; and a team of volunteers read many titles and participate in a week of introductions to more than 250 authors presenting their books through the Jewish Book Council in New York. “In addition to our venturing out, Dallas has earned a reputation as a strong festival with great crowds and we now have authors asking to come to us and we are thrilled. Mitch Albom, Nancy Churnin, Martin Fletcher, and Daniel Silva are all returning and we’re happy to welcome them ‘home,’” said Weiss Crane. Alexandra Zapruder visits Oct. 9 with her “Twenty-Six Seconds.” Fifty-six years after her grandfather Abraham Zapruder captured the assassination of President John F. Kennedy – on what he thought would be a home movie — the author tells the story of the film and its journey, demonstrating how one man’s unwitting moment in the spotlight shifted the way politics, culture, and media intersect, bringing about the larger social questions that define our age. On Oct. 17, Mohammed Al Samawi brings “The Fox Hunt” to Congregation Anshai Torah, describing his escape from Yemen’s brutal civil war with the help of a daring plan engineered on social media. To protect himself and his family from death threats, Al Samawi fled to what became the heart of a civil war, his online contacts responding to his appeal, working across technology platforms and time zones, to save him from deadly forces. Mitch Albom and “The Next Person You Meet in Heaven” arrive on Oct. 18. Of this sequel to “Five People You Meet in Heaven,” Albom says it is the “natural story about Eddie going from meeting five people to being one of five for somebody else.” Albom explores the accident that took Eddie’s life, what Annie lost, and how, in the wake of her trauma, she has no memory of the accident. Pastor, activist, and community leader Rev. Michael Waters, with Congregation Shearith Israel’s Rabbi Adam Roffman, comes to BookFest on Nov. 1 bringing his “Stakes is High,” blending his hip-hop lyricism and social justice leadership. Weaving stories from centuries of persecution against the backdrop of today’s urban prophets on the radio and in the streets, Waters speaks on behalf of an awakened generation raging against racism and fueled by the promise of a just future. On Nov. 28, at Shearith Israel, Marilyn Rothstein talks about her “Husbands and Other Sharp Objects,” the story of Marcy Hammer readying to get herself unhitched – while everyone else is looking for a commitment. Her boyfriend wants to get serious and her soon-to-be ex-husband wants to reunite. When her daughter announces her engagement, Marcy finds planning the wedding while seeing her divorce through a trial – and trying to make everyone happy, proving seemingly impossible. The Tycher Library Community Read, Martin Fletcher’s “Promised Land,” presents Dec. 6. The story is the saga of two brothers and the woman they love, a triangle set against the tumultuous founding of Israel. Tal Keinan and “God is in the Crowd” come to BookFest on Dec. 10. Keinan’s book analyzes the threat to Jewish continuity. He writes of the Jewish people concentrated in America and Israel, having lost the subtle code of governance that endowed Judaism with dynamism and relevance in the age of Diaspora. On Feb. 6, Father Patrick Desbois introduces “In Broad Daylight – The Untold Story of How the Murder of More Than Two Million Jews Was Carried Out.” Debois’s book documents the murder of 1.5 million Jews in Ukraine during World War II and how nearly a decade of his team’s efforts, drawing on interviews of 5,700 neighbors to the murdered Jews, and visits to more than 2,700 extermination sites, wartime records and the application of modern forensic practices to long-hidden grave sites. 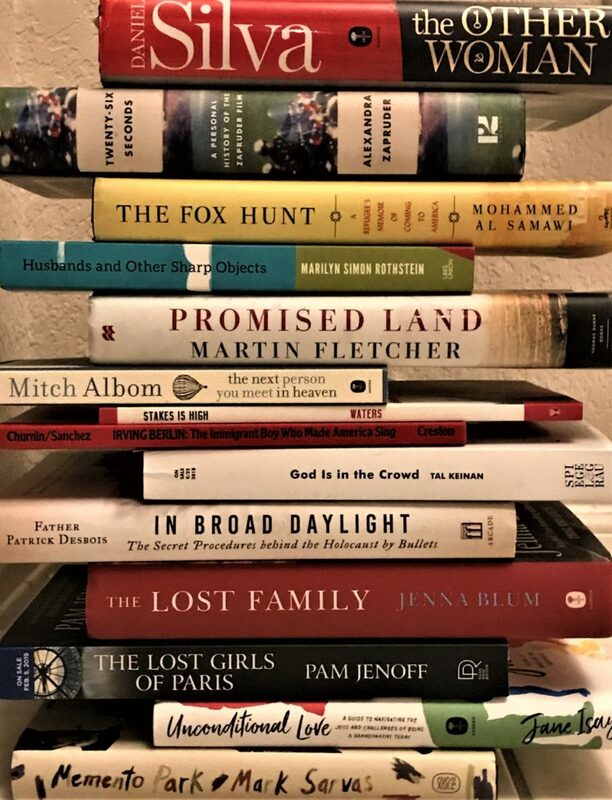 On Feb. 12, Dallas’ Andrea Peskind Katz, of the Great Thoughts Great Readers website, will interview both Jenna Blum about “The Lost Family” and Pam Jenoff about “The Lost Girls of Paris.” Blum’s novel creates a vivid portrait of marriage, family and the haunting grief of World War II. Jenoff’s book shines the light on the heroics of the brave women of the war and their courage, sisterhood and the strength in surviving its hardest circumstances. On March 6, Jane Isay brings “Unconditional Love – A Guide to Navigating the Joys and Challenges of Being a Grandparent Today.” Drawing on personal experience, dozens of interviews and the latest findings in psychology, Isay shows how grandparents can use perspective and experience to create lasting bonds that echo throughout a grandchild’s life. The Tycher Library Spring Read closes out April 3 with Mark Sarvas and his “Memento Park,” a book of family and identity, art and history, and the unanswerable question of ‘how to move forward when the past looms?’ Sarvas’ Matt Santos becomes aware of a painting he believes was stolen from his family in Hungary, during WWII. To recover it he must repair his strained relationship with his father, uncover family history, and restore his own connection to Judaism with a narrative as much about family history and father-son dynamics as about the nature of the art. Liener, who has loved to read since childhood, says chairing the BookFest is a gift to her – the chance to read books and meet authors she might not otherwise as well as giving her the the opportunity to bring them to the Dallas audience. Tickets are $10 in advance and $15 at the door except for the Dec. 6 “Promised Land,” Feb. 6 “In Broad Daylight,” March 6 “Unconditional Love” and April 3 “Memento Park,” which are free; and the Oct. 18 “The Next Person You Meet in Heaven,” which is $30 in advance and $40 at the door, including a signed copy of the book. For more details or to order tickets, call 214-739-2737 or visit jccdallas.org/special-events/bookfest/.